My turkey was too big for my slow cooker, so I ended up butchering it so it would it. I put the legs, wings and breast in and put the back in the freezer. I think it was just 20 pounds, but it sure seems bigger than that! We bought a fresh turkey from our Amish neighbors a few years ago, he weighed 36 pounds and yours is still bigger than that one was! Lol! Too funny! I’m glad your friend saved the day! In our house growing up we never baked turkey. Cajuns “smother” everything and that big guy would have been no exception! These days I roast my turkey but I hope if I ever get in a delimma like yours I’ll remember my dad’s method! We are going to bbq the bird in the Weber. I bet you could fit a fairly large turkey in a bbq, and it frees up the oven. Every Thanksgiving, my kids ask if we’re going to have “soap gravy.” One year my in-laws came to dinner and I asked my father-in-law to make the gravy (his specialty). He asked for a saucepan, so I quickly washed one(I had dirtied every pot, pan and utensil we had. He whippped up the gravy and we sat down to eat. Everyone took large portions of gravy on their potatoes, their turkey, everything. My husband and one of my sons got this terrible look on their faces and stopped eating. The funniest part is, only half of us could taste the soap. I thought it was as good as usual! It is awesome! We raise our own turkeys, and regularly have 20 – 25 lb birds to roast. This pan does an awesome job! Woah!! That turkey looks like he took full advantage of free-range living!! You tell a great story, one that I’m sure will be remembered in the Thanksgivings to come!! Have a wonderful time eating all that turkey!! There was a young boy from our church who raised turkeys for camp money one year. We ordered one. There are only two in our family. When he delivered the turkey…it was 40 pounds! We cut him up and smoked him because it would not even fit in my oven! Thanks for the good laugh this morning! Happy Thanksgiving. As soon as I saw the turkey peeking out of the roasting oven I died laughing! I love your sense of humor! Can I ask how much you pay for your farm turkey? It was so discouraging trying to even find a healthier turkey this year. The local farms that sell turkeys were all charging about $75- $85 for one, which we could not afford. The next choice was a fresh turkey from the store (which I had heard are not supposed to be injected with junk) but found out they are injected. It was too late to get a wild one as the hunting season is over, so we ended up having to buy the factory farmed, frozen, injected with junk one this year in the end. I now have a year to try and find a better one for next Thanksgiving. We were given a 20 lb turkey a couple years ago. Had to go out and buy a roaster – since the donor was coming for dinner and expecting her turkey to be served. The bird fit inside with room to spare. The bonus was that the roaster freed up the oven for homemade bread and sweet potato casserole. Perhaps i’m missing something, but why not just put aluminum foil (yeah, i know, i don’t like it either, but sometimes you have to bite the bullet) around the top of the roaster? I do that all the time with my slow cooker when a frozen beef roast sticks out the top. Once it’s cooked a bit and fits, i take the foil off and put the lid on. Not going to happen with the turkey, but the aluminum foil should do the trick. Have a great Thanksgiving! LOL. I had this same problem two Thanksgivings ago. We called my father in law to see if he had a larger pan and instead of a pan, he brought over that stand thing that you put chickens on to roast. Needless to say, that did not even come close to working, although we got some really good laughs out while trying to put this huge Turkey on that little bitty stand! I think we ended up with one of those aluminum disposal pans as well. Last year we bought two huge pans on sale so we don’t have to repeat that again. And, I try not to go for THE largest Turkey in town anymore. Couldn’t you have used foil to cover the electric roaster that you had? Did you ever consider cutting it into pieces to roast? It would require more than one ‘pan’, but since you’re roasting early, there could be roasting batches. To avoid the aluminum foil ‘lid’, I put a large piece of parchment paper on the turkey first. I got the idea to use parchment paper from watching Martha Stewart wrap her turkey in sheets of parchment paper. LOL Have a great thanksgiving with your family and friends. wow, that is a big turkey! Glad you got him all cooked and ready to go. Happy Thanksgiving, Laura! I have to thank you for a great story and lots of laughter. I read it out loud to my 3 girls we all got such a kick out of it. We have raise many heritage breed turkeys and we know joys of getting one of those large bone breasted free range turkeys into a pan to cook up! LOL. Thank you again for the laughs I was stressing today but the Lord used you to lift my spirits. God bless! I have this problem often, as I often buy a huge turkey. I plan to solve the problem this year by cutting said huge bird into two parts, the white part and the dark part. It’s easy (so they say). We shall see. I am told that in addition to fitting in the oven, the white and dark can each cook at their own pace and reach a state of perfect doneness without drying out or undercooking the other part. BTW, this year, it is Orange Roast Turkey with Orange Gravy. The last time I did orange turkey it was delicious. Again, we shall see. This year I only have a 22 pound turkey. 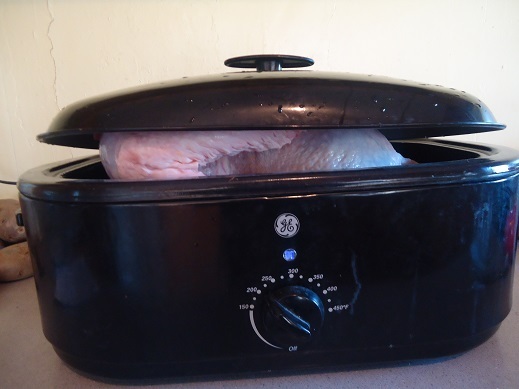 About 8 years ago I bought an electric roaster what will fit about a 25 pound turkey in it. At least that is the largest I have tried. You would think I was feeding an army, but we cook the meal and then take it to my father-in-law and leave the leftovers for him to freeze and eat during the next week. I have had a turkey that was too big before. 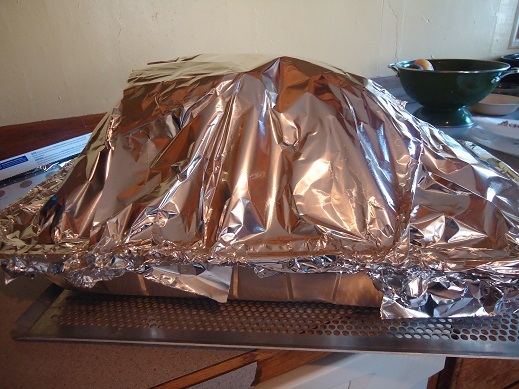 I just tented foil over the top of the roaster oven. Is 1 1/2 lbs. per person really what I need? I’m making turkey for 24 and got an 18 lb. bird–the biggest one at the store. Leftovers are yummy, but I don’t necessarily need them. And yes … I know that’s supposed to be “a future fyi”, not “an future fyi” … my fingers sometimes get away from me on the keyboard :) Oh well! I believe you made everyone else let out a sigh of relief that everything doesn’t always go just how we picture perfect it in the mind we make it. I loved the story because it could of happened so easily to me. After all, the ending proves we are overcomers. We had a similar experience. We have a big family and the whole gang(almost) was here, so I bought the 25 pound turkey. That roaster lid was at least 3 inches from meeting the bottom part. 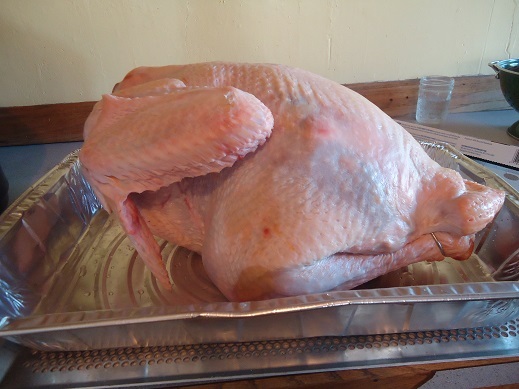 My husband had to do some serious operating on Sir Timothy Turkey to allow him to “almost” fit in that roaster, then we still had to do some major aluminum foil and various other wrapping to get him cooked. Even if I had had a pan big enough to put him in, in the oven, that wouldn’t have worked because my oven was FULL of many other dishes cooking. I will definitely be on the lookout for a different option for the future cooking of said large turkeys :), which was delicious in spite of the delays. 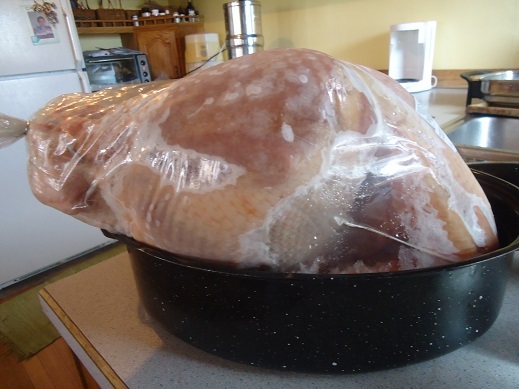 How do you thaw such a large bird? Thawing is always the hardest part of the process for me. I put a frozen bird in the fridge and 5 days later it was still frozen. Usually thawing in the fridge is the best route to take…I have heard mixed reviews on putting it in a water bath. The best advice I can give is buy in advance and let it sit in the fridge until it is ready. :) Sorry that is not more helpful! We purchased our grass fed organic turkey from a local farm at it clocked in at about 21#’s…I usually cook a 20-25# turkey so we have plenty to make things with afterwards! I am not going to have fun thawing the thing that is for sure! That was exactly my plan this year, however, I was doing double chickens. Nice to know I am not alone in that thought department. LOL….Big? My brother in law raises the turkey for the annual Thanksgiving feast for around 40 of us. 2016 bird weighed in at 42.5 lbs, and THIS year’s version is a whopping 48lbs. No different than cooking any other large turkey….roast starting at 0530, and baste every hour (tented when browned) and we gather and eat around 4-5pm. Never had a dried out bird and it is done all the way to the backbone. Use 3-5 cans of chicken broth in the bottom of the open roaster with large rack to keep it moist.